How often do you check Facebook while on your mobile device? Have you ever wondered when Facebook users check for news feeds, notifications or messages on their mobile phone? 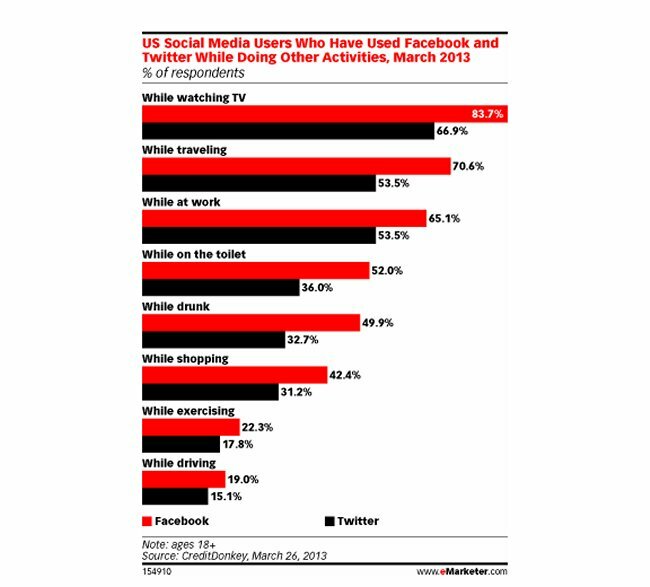 According to a study by CreditDonkey, the majority of users check Facebook while watching the TV. That’s 83.7% of them. Interestingly more than half the users check Facebook on their phones while at work, sitting on the toilet, and while drunk. Out of those polled, 1 in 5 admit to checking Facebook while driving. That number is likely higher since many would never admit that. Still, the ones that did are too many anyhow. Some people just don’t think. And these numbers suggest that maybe we should all get a life.